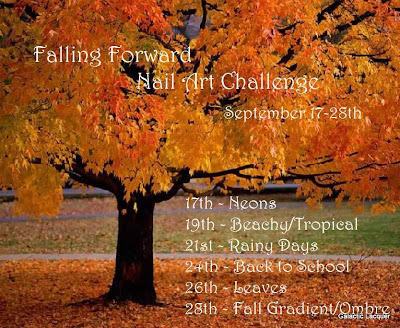 It's the end of the first week of this challenge! Another week to go. I've been having fun with this transition from summer into fall, and I'm looking forward to the actual season change here in Florida. For today's theme, we have Rainy Days! I'm familiar with that in Florida! Almost everyday has been a rainy day here. And if it doesn't rain in the morning or afternoon, it's been raining at night recently. I actually love the rain, as long as I'm not caught outside without an umbrella! If I'm home and it's a rainy afternoon, I love to make some soup and then cuddle up and take a nap afterward. As for my nails, I couldn't think of a good way to represent rain the way I see it and the way it makes me feel! 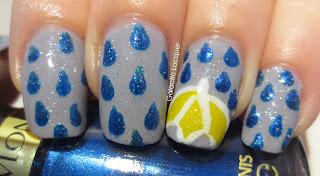 So instead, I opted to do a literal interpretation of a rainy day with rain drops, gray skies, and a bright umbrella. I started with Zoya Carey for my rainy gray skies. It's a gray with cool undertones, so it went well with the blue. 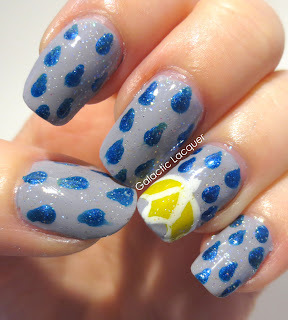 For the rain drops, I dotted Revlon's Mysterious, and then tried to drag a bit to make them more like falling water droplets. 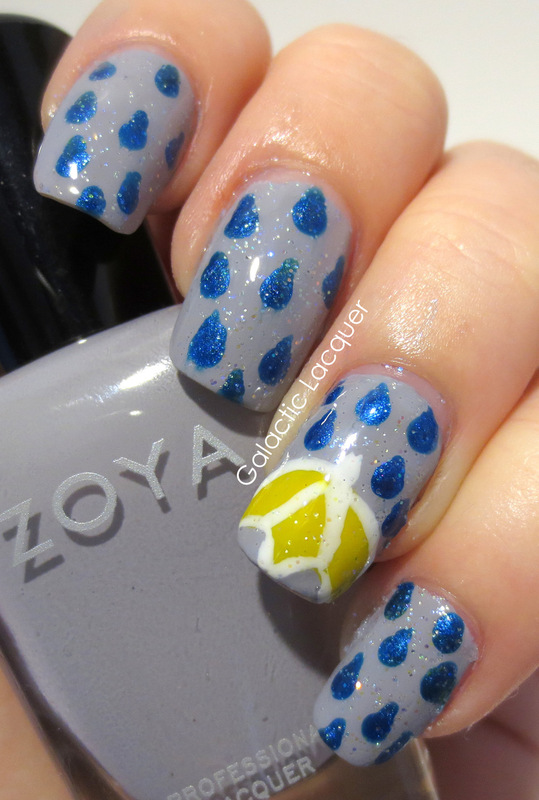 I then used my nail art polishes to make a cute little yellow umbrella for the accent nail. With no handle, it's a little hard to tell it's an umbrella though! 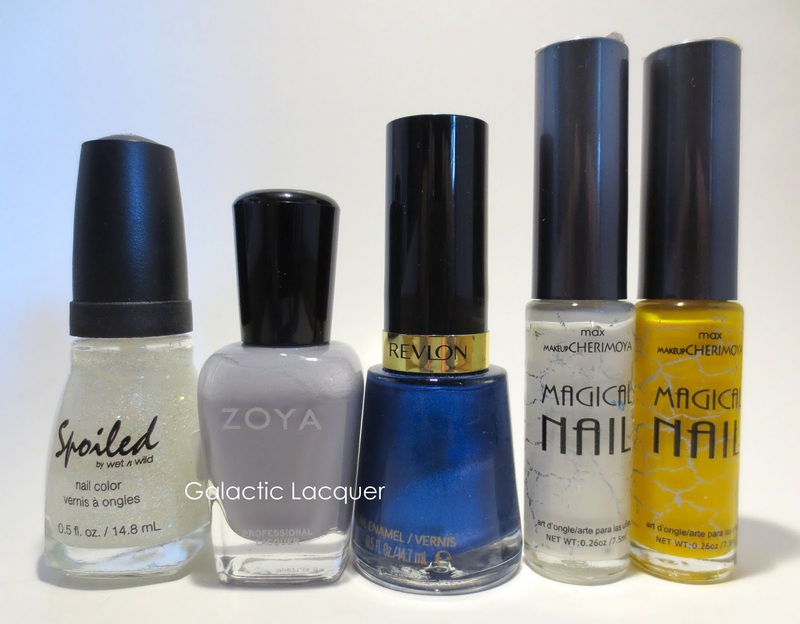 I was debating on which shade of blue I should have used for the rain drops, and whether or not I should add blue rhinestones to some random ones. I couldn't decide if I should go lighter or brighter, but I guess the darker blue works since it's a bit gloomier. I also added the extra bit of sparkle for the mist, though I wish the gray I used was a bit darker to contrast it better. Check out these other great blogs participating too! This looks great! So cute! 750 Facebook Follower / Halloween Giveaway!